Tagged racing, redbull, rookies, sepang. THERE are some things between men and women that will always be up for debate. Such as which gender is the better cook, better at reading maps and better at doing laundry. The upcoming Red Bull Rookies Sepang 1000km endurance race is going to answer one debate – which gender is better at racing? 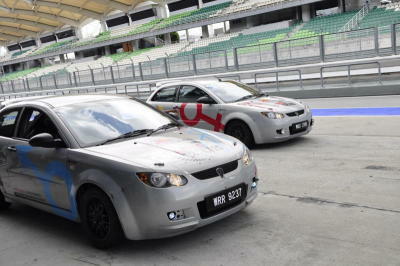 On Dec 6 to 8 this year, two teams – four male drivers on one team and four females drivers on the other – will try to outwit, outlast and outrace each other on the Sepang International Circuit to win RM10,000. And, of course, determine which gender is better behind the wheel. 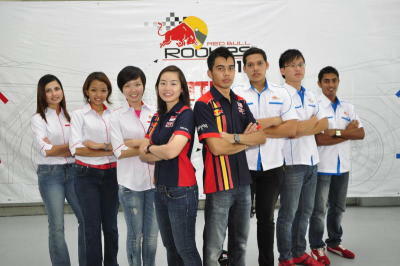 The Red Bull Rookies 2012 lineup will see a team of four female drivers go up against four male drivers. The drivers are (from left) Siti Zirwatul, Taryn Lim, Andrea Tay, female anchor Melissa Huang, male anchor Mark Darwin, Rezza Amir Ariff, Matthew Ng and Amrit Mirchandan. The responsibility to lead the male team falls on the shoulders of anchor driver Mark Darwin, with Melissa Huang leading the female team. “My job is to lead the team of three new rookies through the technical and safety aspects of the 1000km endurance race,” said Darwin, 22, a former Red Bull Rookie himself. When Red Bull Rookies started out in 2007, the competition was solely focused on looking for the next best amateur female racer. Just last year, the competition was opened to include one male driver among the female competitors. That lucky driver was Darwin. “Growing up, I’ve always been into motorsports. Previously I was a drag racer. Then when I heard Red Bull Rookies was looking for a male driver, I went for it. So yeah, this has become my stepping stone into the world of circuit racing,” he said. Huang, 28 is a nurse by profession and like Darwin, she was also a Red Bull Rookie last year. “I feel that I’ve been given a wonderful opportunity to race. In fact when I do go to the track, many of the guys are envious of the fact that Red Bull is sponsoring us for upcoming race in Sepang. “What I like about this sport is the need to be decisive in split seconds and the precision required to tackle turns,” she said. One of Darwin’s rookies this year is Rezza Amir Ariff, 24, who explained to us how the race will go. Basically, it’s a 1000km race, and each of the four drivers will take turns driving. “This is going to look at how well you drive the car. You have to drive it smoothly, fast and ensure you don’t damage the car too much because all the other drivers will depend on that one car. This race can go on for up to eight hours,” he said. The cars the two Red Bull Rookies teams will be driving this year. Rezza just graduated from Monash University with a degree in psychology and communications, and he still can’t quite believe he’s actually part of the Rookies programme now. As for Huang, one of her rookies is Andrea Tay, 25, from Singapore. Tay confessed that unlike her teammates, she doesn’t have much experience on the track but she’s making up for it by working hard. “I compensate by learning from watching YouTube videos, studying the track intensively and remembering whatever is corrected by the team manager,” she said. Nevertheless, Tay is looking forward to the race and is confident that she will not let her teammates down on her debut.